Thai mangoes are currently in season in this part of the world and I can think of heaps of stuff to bake using this delicious fruit. Of all the desserts to pick from I decided to try my hand at a Mango Mirror Cake. The name sounds exotic doesn't it and the end result taste even better. I was at first intimidated by the length of this recipe. Don't be ... just read the recipe by sections and you will be fine. In fact you can split the entire recipe over two days. I do believe as I grow older, my brain can only digest so much words in one sitting before its CPU crashes. You may laugh, but I do think it applies to me personally. For this particular recipe, I settled for individual mini cakes instead. Instead of a 4 layer dessert, I ended up with 6 layers instead. All I can say it .. yum and it was delicious. I cut out parchment paper to line the sides of my mini mousse rings so that it'll be easier when unmolding the cakes. I would like to dedicate this post to my mum ... Happy Mother's Day Mummy! And also to all mums reading this blog! You all deserve the best! 1) Preheat oven to 200C. Line the base of 2 9" round cake pan with non-stick baking paper. Grease the sides of the pan. 2) Use an electric beater to beat the eggs and sugar in a medium bowl until thick and pale, and a ribbon trail forms when beaters are lifted. Use a large metal spoon to gently fold in the flour mixture. Do not overfold as you don't want to deflate the batter. 3) Spoon mixture into the lined pan and smooth the surface flat. Bake for 13-15 minutes or a skewer inserted into the center comes out clean. 4) Immediately turn the cake onto the paper-lined rack and remove the baking paper. Leave cake to cool completely. You can make the cake a day ahead. 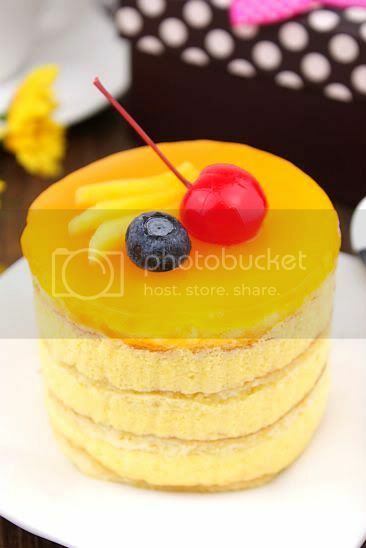 1) Sprinkle gelatin on mango puree and set aside until spongy. 2) In a separate bowl whisk the egg yolks and sugar until thick and pale (about 2 - 3 minutes) and set aside. Put milk into a pot and bring to a simmer. 3) Remove milk and slowly pour into the egg mixture, stirring at the same time so as not to scramble the eggs. Sieve the mixture and pour it back into the pot. 4) Return the mixture to pan and cook over medium heat, stirring constantly until it thickens. Do not bring to boil or mixture will curdle. 5) Immediately remove from heat and add the mango gelatin mixture. Stir to mix completely. 6) Place mousse over a bowl of ice water. Add in lime juice and yellow food coloring. Let cool, stirring occasionally until the mousse thickens to resemble softly whipped cream. 7) Pour thickened cream into a bowl and whip until soft peaks. Fold the whipped cream into the mousse mixture. Place mixture in the refrigerator. 1) Place mango flesh, sugar, and 50 ml water in saucepan. Cook over low heat, crushing the flesh with back of a spoon to start juices flowing. 2) Simmer for 10 minutes. Pour through a colander and drain into a bowl. Do not press down the pulp too much or your mango mirror won't be shiny because of the pulp. 3) Place lime juice and extra water in a small bowl. Sprinkle gelatin over this mixture; set aside until spongy. 4) Put the mango juice into a pan and bring to a simmer. Pour over the gelatin mixture and stir to dissolve. Tint to desired color with yellow food coloring. Place bowl over bowl of ice water and stir occasionally until the mixture is syrupy and just beings to thicken(do not let jell). 1) Lightly grease a 9" springform pan and line the bottom with parchment. 2) Cut out a cardboard circle that is exactly the same size as the bottom inside of the pan. Cover cardboard with aluminum foil and fit into bottom of pan. 3) Center one layer of the cake bottom of pan. 4) Pour about half of the mousse over the first layer of cake in the pan. Refrigerate for 2-3 minutes to firm the mousse a bit. 5) Set the next layer of cake on top of the cream. Pour the remaining mousse over the cake and smooth the top with a patula. Refrigerate for about 2 hours (or overnight) until the mousse sets. 6) Prepare the mango mirro. Pour over the top of cake. Refrigerate until set. 1) Wrap a hot towel around the outside of springform pan for a 2-3 minutes. 2) Run a small sharp knife tip around the edge of the cake to separate it form the sides of pan. Mirror will tear when sides are unlatched if it is stuck at any point. Slowly unlatch the pan. Slice cake into wedges. Brussels calling!! What a festive cake this is!! Looks so apart & so flavourful too! I so love mangoes! it's such a beautiful cake! You are so lucky to have mangos as a local food! The mirror tops are lovely... YUMMY! Mangoes in season??? Because here in Australia, mango season just finished not long ago. But I'm seeing a lot of figs and passion fruits.Love the mirror, so smooth and velvety. Nothing beats homemade eh? That's a lot of mango puree in the whole recipe! Nice name! I had lots of mangoes when I went back to Malaysia last month. I should have shipped back a box! I feel so ashamed of myself. Not a single plan of my to-be mother's day cake came true and the mango mirror cake was exactly one option that I was contemplating about! Hehe, I hear you about the brain drain - I'm the same. So thanks for breaking up the recipe into manageable chunks. Your cake looks spectacular! Nice one, Jo -The mango looks so fresh and inviting. Beautiful photos too. I tried making a mango mirror cake once....it failed badly. Yours looks so pretty and delicious! I'm so jealous you have mangoes now! oh my! I haven't made a mirror cake for ages. Love the mango flavor! 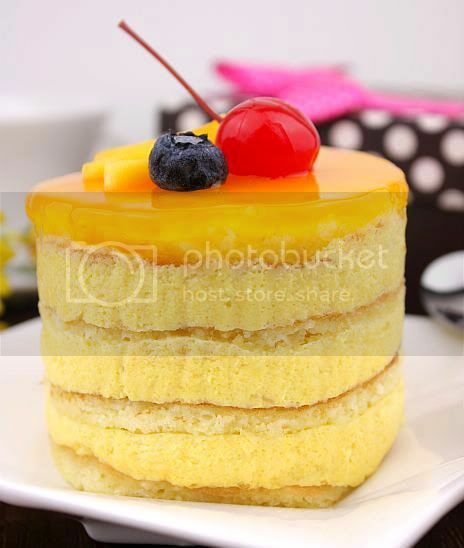 Wow, this mango mirror cake is really stunning! It is a suitable dessert after dinner. Looking at these tempting photos, I wish I would have one with me right now! Hi Sophie, Symphonious Sweet, Ellie, Tigerfish, Shirley, Mary, Anh, Von, Kris, thanks for dropping by. This dessert was delicious and mangoes are a great medium to work with. Hi Tracie, I know what you mean as well because I pushed off from making this recipe for a long while now. Hi Food For Tots & Bel, LOL I sometimes "crash out" too! If only I can swap for more rams to my CPU! Hi Quinn, mangoes are in season now. We have been getting a few varieties especially from Thailand. Hi Youfei, yes I remember you. How are you? Have you made any fondant cakes? Hi Anne, yes you should have shipped some back. I think they are pretty ex at your place - prob not as fresh either. Hi Quinn, I actually doubled the mirror topping as the original recipe's one was insufficient. I followed the original piece and had to make another batch again. But you can really taste the mangoes with each and every bite. Beautiful! It should be on display and in my mouth! Wow, your front page is loaded with treats for the eyes. If I go back any further I might eat your blog!